The scale of Festivals has deminished in recent years, but for uptodate information either contact Copeland Council or Richardsons Wines. In 2015 thousands were treated to an enthralling mix of stilted jugglers, live jazz, artisan food, mingling celebrities, make-overs and cookery master classes at this years Home and Garden Festival. The Festival Co was founded in 1998 by a volunteer board of directors and it remains all volunteer to this day despite having been credited with creating a spend of over £40m to West Cumbria since 1998. Day to day running is from an office in Richardsons Wines on Lowther Street. McFLY  one of the biggest pop bands to come out of the UK  played in Whitehaven. On Friday, June 21, McFly performed on Whitehavens harbourside. The tall ships coming for 2013 included The Pelican, a 45-metre sail training vessel from Weymouth, Dorset, which is coming to the festival for the first time, as is the Johanna Lucretia, built in 1945 in Ghent, Belguim. The other two have been before  the Bessie Ellen and Ruth. Also this year there will be a giant continental market. The Sunday afternoon charity gig (June 23) with Les McKeowns Bay City Rollers. The Festival in 2012 featured the concert by Katherine Jenkins and the National Philharmonic Orchestra although there will be a lovely atmosphere throughout the town for the two or three days building up to the event. Saturday saw the Seventies Stars and Sunday includes the Charlatans and The Enemy live on stage. 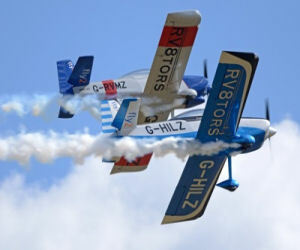 The RV8tors display team combine high speed (up to 230mph) with tight formation aerobatics, promising an exciting and memorable show. A high energy show is also on the cards from the Breitling Wingwalkers  who call themselves the worlds only aerobatic formation wingwalking team. If you are travelling by car, please remember that the town has limited space but we have two big car park and ride operations. From the North you can park at Lakes College and from the South, Westlakes Science park. The park and ride is operated by Reays Coaches. Times and prices to follow. Tall Ships, Cookery demos, Jet skis, fairgrounds and stalls open all three days. The festival June 25, 26 and 27th in 2010 was a huge success again. Highlights: Friday: Fish cooking and Afternoon Tea Demos on the Sugar Tongue, Jet Skis and Book Launch by Jean Christophe. The latter is at 6pm. Saturday: Live music on three stages including Madness, street theatre, Jet skis and celebrity chef demos. Sunday: Forces Parade starting 10:30am at the Sea Cadets and finishing in the Arena. Spitfire flypast at 12:30 and Full air show program from 3pm. On stage Razorlight. Some pictures from the 2010 weekend. The big events included an Armed Forces Day and celebrity chefs. Status Quo are to play at a 2,000 capacity venue by the harbour. One of the most intimate performances you will see. One of the Worlds top artists headlining the Friday night (June 25)of the Festival. Status Quo rocking all over the harbour! Vast array of attractions including three fairgrounds and a giant Ferris wheel that Gerard Richardson has nicknamed The Whitehaven Eye. There was also a huge floating bubble being walked around the inner harbour. There will be a military village with impressive gear from all the armed services, even including a missile rocket system. 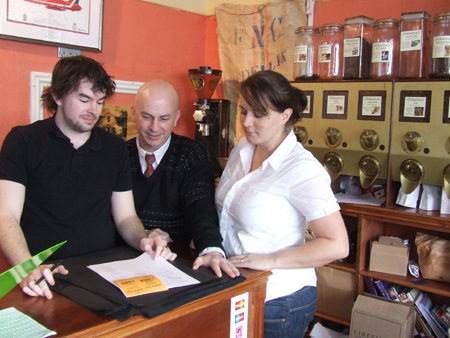 2010: Festival organiser, Gerard Richardson, the towns independent wine merchants, is to receive a special award for his efforts in promoting goodwill between the United Kingdom and America as a result of the US Navys involvement in the Whitehaven festivals. Every year the US Ambassador to the UK can award up to 10 letters of commendation in three categories. Mr Richardsons special efforts with the Whitehaven Festival and its American links have been appreciated by the US Navy in particular, earning him a nomination culminating in the special award. The Whitehaven Food Festival attracted nearly 100,000 people over the weekend. The weekend also featured a dramatic fly-past by the massive V Bomber, Vulcan B2. See a live webcam view of the harbourside.. There were celebrity chefs Jean Christophe Novelli and Ainsley Harriott. 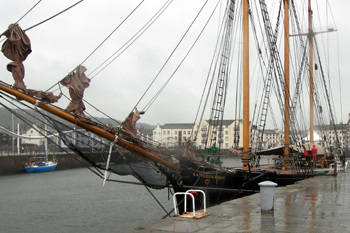 On the harbourside alongside the 'Kathleen and May' it is expected to see the two masted brig Irene on a visit. WHITEHAVENS Maritime Festival went International and even bigger in 2007. The FREE event has now officially been branded the Whitehaven International Maritime Festival. Next fest expected 2010. The Festivals company in 2008 organised a Status Quo open air concert in Whitehaven.Following on from the success of Status Quo last year, the Whitehaven Festival Company is planning another major music event. A number of big names has been approached for the concert, which might take place over one or two days in June or July 2009. The Red Arrows swoop as a mock battle rages around the Grand Turk the ship that starred as the Indefatigable in the TV Hornblower films. Well done to all the volunteers who made it such a success. Next Fest anticipated to be in 2010..make a diary date! Through the day: Balmoral cruises. MAD stunt riders (Stobart stage); chef Keith Floyd. 10.45pm Friday evening fireworks display. 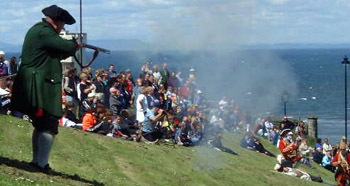 3.30pm Historic re-enactment of a cannon fight between two pirate ships. Both Saturday and Sunday; Spitfire, Hurrican and Dakota fly pasts. Throughout the day chef Jean Christoph Novelli.Balmoral cruises. 11.15 am Falklands Memorial service and possible fly-past. This year's event also featured the Red Arrows, Tall sailing ships and much much more..
SPONSORS 2007: Eddie Stobart joined a firm list of major past and present sponsors, including Copeland Borough Council, British Nuclear Group, UKAEA, Cumbria County Council, the NDA and Westlakes Renaissance. Luke and Ged Richardson and Sherie Lewthwaite. Arriving on the evening tide of wednesday June 13, just ahead of the festival weekend, the Grand Turk will be docked off the sugar tongue for the duration of the festival where she will be open to the public for tours. The maritime festival is delighted to welcome back one of our old favourites, The Zebu. built in Sweden in 1938, she was originally a high canvas merchantman trading in timber along the Baltic ports. Once again the Matthew of Bristol will be visiting Whitehaven, it is the vessel second visit to the town but its first to this event. the new matthew of bristol is a replica of John Cabbots ship. Cabbot was the original discoverer of North America, not Christopher Columbus as most people believe. The Glaciere...Over 100 year old Baltic trader rescued from the mud of the Mersey and lovingly restored. 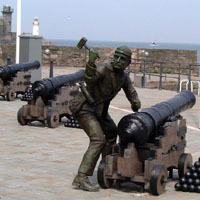 The 2005 Festival, the fourth hosted by the town, took place on June 25-26 and is timed to coincide with the International Year of the Sea and Nelson's death at the Battle of Trafalgar 200 years ago. It attracted 250,000 visitors and was blessed with sunshine throughout. Among attractions were the Utterly Butterly flying circus (Pictured). There were fly pasts by the Red Arrows, and Tornado jets plus a World War 2 fly-past..
Four tall ships came for the event; Liverpool's flagship the Zebu and sail training ship, Jean de la Lune, Scotland's only working square-rigged tall ship. They will also be joined by Jeannie Johnston and The Kathleen & May a wooden coaster launched in 1900, costing around £2,700 at a time when shipwrights earned the equivalent of £1.25 a week and was among the last four vessels who remained on trade routes in British and Irish waters. Her home was the Port of Bideford in the West Country until her retirement in 1961. She was purchased by a private trust in October 1998 from Gloucester Docks and brought home for a £1million restoration. The Zebu came to Whitehaven last year especially to take part in the festival, choosing it over Liverpool's own maritime event. Its success in the town convinced the crew to return to Whitehaven when it took part in a BBC film later in the year. Jean de la Lune, a 100ft French brigantine based on the west coast of Scotland, is coming for the festival on her farewell voyage before being sold. As part of the Festival, Cumbria marked the 60th Anniversary of the End of World War 2, with a Veterans and Ex-Service Personnel Parade on Sunday 26th June 2005. 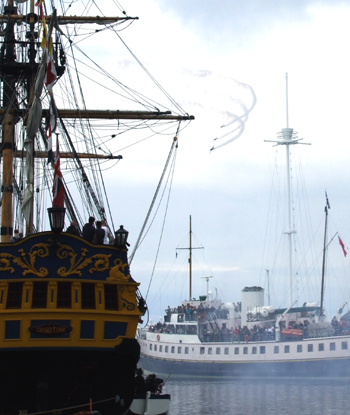 2003 Maritime Festival (June 14-15) was a sell out success with an estimated 200,000 visitors and some £1 million injected into the local economy. The 2003 show enjoyed brilliant June sunshine. The next Fest will be on June 25th 2005. Tall ship the Zebu and the arrival of American warship the USS Leyte Gulf were among the key attractions for the 2003 Fest. And in complete contrast the British Jet Ski Display Team racing at high speed around the harbour. Other attractions for the 2003 Fest were HMS Biter from the Royal Navy, and an air-sea rescue display by the RNLI. In the air, there was a fly-past by the Battle of Britain squadron, featuring the Lancaster, Hurricane and Spitfire, on Saturday, June 14, while on the Sunday a spectacular display by the Red Arrows. On the harbourside at the festival, on June 14 and 15, were stands offering a wide range of attractions including the ever-popular Made in Cumbria food and craft tents. There were two free open-air concerts on Saturday evening: an Abba tribute band will be performing on The Whitehaven News stage from 6pm, and then there will be a jazz concert, on the Radio Cumbria stage, by Kenny Ball and his Jazz Men. The concerts were followed by a fireworks spectacular over the sea. Also there will be performances by the Central Band of the Royal Air Force, while local schoolchildren will be delighting the crowds on The Whitehaven News stage at the Hub. Steamer, Balmoral will be running trips down the coast on both days, as well as coming into the harbour on the Saturday evening. There will be a yacht regatta outside the harbour. 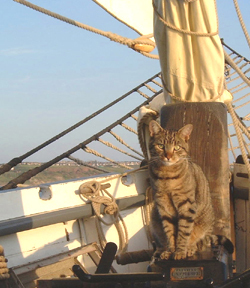 In July 2002 Whitehaven had a mini festival atmosphere as three tall ships bid sailed into port for a highly succesful month long visit. The ships, Kaskalot, Earl Pembroke and Phoenix...were enjoyed by thousands during the long stop over. On the evening of Friday June 21 hundreds sang along to Land of Hope and Glory at the Whitehaven "Proms" when the Royal Liverpool Philharmonic Orchestra performed on Whitehaven harbourside. The concert was to mark both the 150th anniversary of The Whitehaven News, and the Queen's Golden Jubilee. The event, , in conjunction with the Whitehaven Maritime Festival company, was a resounding success complete with fireworks finale. 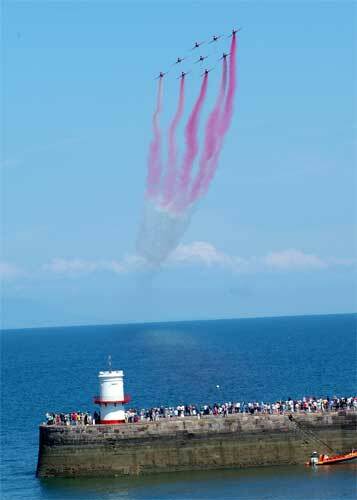 The Whitehaven Maritime Festival...weekend of June 23-24 2001 attracted an amazing 100,000 visitors. Estimates of the crowd at the May 1999 event vary..40,000 up to 80,000 but thanks to sunshine and a lot of hard work by a lot of people the Whitehaven Rum Festival as it was billed had the town swamped with visitors. Highlights of that year's events(Seen below) included the Caribbean parade and re-enactment of a rum smugglers' capture, complete with a "gruesome" mock hanging in authentic 17th century style! The Festival brought to life much of the fascinating history behind the port of Whitehaven. In the 17th century Whitehaven built brigs dared the Atlantic storms to take part in the trade in rum, tobacco, limes and sugar from the early colonies in America and the Caribbean. There are even less mentionable instances of Whitehaven built ships taking a minor part in the grim slave trade at these times. 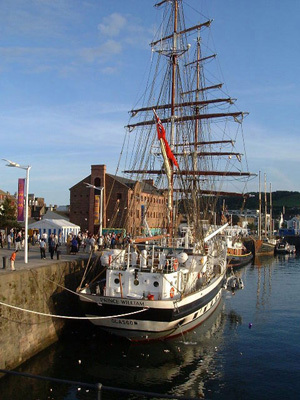 To see more of the tall ships in Whitehaven. The event was closely associated with the Rum Story, Whitehavens newest £3 million visitor attraction, which opened on Monday, May 22 2000. This information provided as part of the Lakestay web site.